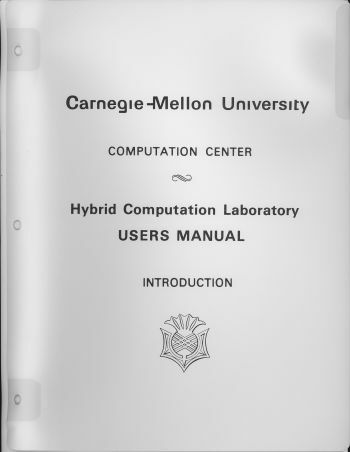 This page continues the documentation of the computers at Carnegie-Mellon University in the 1960's. You can click on the links above to learn about some of the other computers. Anyone remember the big analog computer in the basement of HH? Photo taken by either Pat Stakem or Chris Hausler. The arm is either Ray Carson or Ron Herold (now WD4IAD). In a letter that I received from Dean Williams in 1966, he described "a special computer laboratory with a G-15D digital computer, TR-10 analog computers and a DDA-20 digital differential analyzer". Here is a link to a TR-10 web site. Is it the computer we had? It was made by a company named Electronic Associates Incorporated. Looking at the physique of the arm in the picture you refer to - I don't think its mine. It is in much too fine a physical shape. I am in physical shape... Just remember Round is a shape. The site is full of pix and memories. Glad you have them down and visualized - as our memories fade. College is so far in the past. Best wishes to you and Sally for the holidays and coming year. Thanks for keeping in touch and find time to come visit. 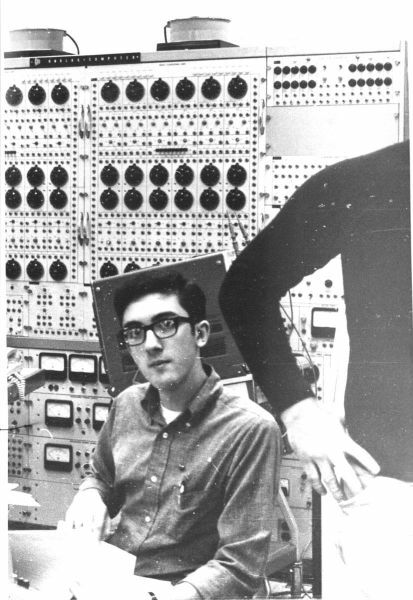 Hi, I hadn't stopped by the Athena site for a while, and came upon the photo in front of an analog computer "1969 Mark DiVecchio - Carnegie-Mellon University". It is a GPS unit. Very distinctive looking, and is similar in appearance to the unit we have at the Computer History Museum. Note the company logos match.. I'm not sure of the exact model, guessing one of their last units from the 60's. If someone comes across documentation from GPS, please let me know since we have almost nothing in the archives on the company. The Hybrid Lab was actually half a flight down from the parking lot and had a PDP-9 interfaced to an EAI 680 analog machine. Apparently the 9 could turn the pots on the 680 which were designed to be turned by people. Since it could turn them much more frequently than real people it was wearing them out :-) The 680 was plug board programmed. The 9 had DECTAPES and I still have one (the one "micro tape" I had originally purchased from the CIT bookstore for the PDP-8 but then could never use on it, as described on the web site) with PDP-9 FOCAL on it as well as some FOCAL sources I wrote. Every time I would use the machine I would finish by having PIP print a directory of what was then on the tape to the 9's console. The last printed directory is still folded up with the tape. Looking at this print out the tape also has a copy of those two "music" paper tapes I had gotten from DECUS for the PDP-9 as well as some other stuff. I vaguely remember a "hybrid computer", with an analog computer connected to a digital computer. On the analog computer, differential equations could be solved by including resistors, capacitors and inductors that were "analogous" to the problem you wanted to solve. I seem to remember the analog computer connected to a DEC PDP 9. I never actually used the system, so I don't know exactly how it worked. Just like I remember seeing the Athena, but never actually used it. I do remember a BIC pen in the Athena's plotter. Really classy, I thought. There is a photo of me in front that analog computer on the ASDG web page. I remember it as being on the ground floor of Hamerschlag also. As I recall, I never got it to do anything intelligent. Dave Vavra was the sys programmer for the hybrid lab - when we hear from him, it should clear up some of the questions. The analog computer that I played with didn't have any digital computer interface. May have been an earlier one. We had some simple analog computers in high school so I actually knew how to program one. I remember Frank Caimi and I doing some stuff on it to solve some lab problems. Again, the machine in the photo is not the EAI 680. See <http://archive.computerhistory.org/resources/text/EAI/EAI.680.1965.102646244.pdf> for an advertising brochure showing pictures. It is advertised as a hybrid computer in that it has digital interfaces specifically designed for an external digital computer and refers to being ideal for new university "hybrid" programs. Sound familiar. As you can see from the photos in this document the 680 was programed on a plug board. This allowed multiple users to wire up their experiment and then take turns running it with other users without having to un-wire between experiments. The unit in the web page photo is not plug board programmable. Also googling around I came across a second analog computer web site. Going to its listings for EAI it shows a number of "PACE" models and although not exactly like the photo on the web site, damn close. So the machine in the web site could be an EAI, just not the 680. The reference is <http://dcoward.best.vwh.net/analog/eai.htm> If you go to the home page for this museum it lists many analog computer manufactures including Heath and analog computers tend to all have a similar appearance, panels with lots of places to plug patch cords. There are a number of other sites with even better photos of the 680 than the above brochure, this all from typing "EAI 680" into Google. I recall that we had the small desktop sized PACE TR-10 in room 55A. I never used it. But I don't have any hints about the model number of the unit at CMU. Was this older unit replaced by the hybrid computer? Although I had come across that old ads site before I hadn't spent a lot of time with it. I see the tape drives on the G-20 were made by Potter. There's a nice brochure about the Univac 1004 III showing the Uniservo VI tape drive. I remember seeing one of those Minivac 601's for sale in a local electronics store. In March of 2010, Pat Stakem sent me a several inches thick manual from the Hybrid Lab. I'm going to scan it and make it available here. After I scan the manual, I will be sending it on to its final home. Interesting! A while back we were chatting with Al Crew, I thought he said that the Hybrid Computer system was still in place when he was there, several years after this notice of sale and possibly what I saw in the back of the computer room on my fall 1976 visit with Pat and Russ. Of course, the whole hybrid computer thing was kind of a flash in the pan. Digital technology combined with numeric methods rapidly overtook any advantage possessed by a hybrid system and was certainly a simpler solution. So I guess I'm not surprised that it didn't sell. I wonder what was eventually done with the system as I don't recall seeing it on my next visit in the early 80's (82 or 83 IIRC).